In this article I will describe how I build my first physical sensor, based on an ESP8266 microprocessor and a DHT22 digital temperature and humidity sensor. It is important for me to note, that I’m by no means an expert in programming Microprocessors or in electronics, this is my first approach in both! In my own words: ESP8266 is a small, affordable microprocessor with onboard WLAN. There are various versions of the ESP8266 which differ in amount of GPIOs, memory, etc. For programming the ESP8266, or flashing new firmware onto an ESP8266 there are various options, I have chosen to use the Arduino IDE to code, compile and flush new firmware. IoT-Playground.com has an excellent tutorial on how to setup the development environment. DHT22 is a digital sensor which is capable of measuring the temperature and humidity of his surrounding environment. There are, again, multiple was to achieve your goal. Some supplier provide development boards which you can directly connect to your PC and Powersupply and others wire the ESP8266 via an USB-2-TTL adapter and breadboard. For my ESP8266-01 I have chosen to follow the setup, as described by arduinoesp.com. The following code combines all the above fragments, puts them into the right order, etc. The following simple image shows how I connected the two parts. You will only have to add your 3.3V powersupply. Have fun re-doing and stay tuned for the next blog, which will cover receiving, enhancing and forward of data on the Smart Gateway. To get the code compiled, you need to install the Adafruit DHT library. 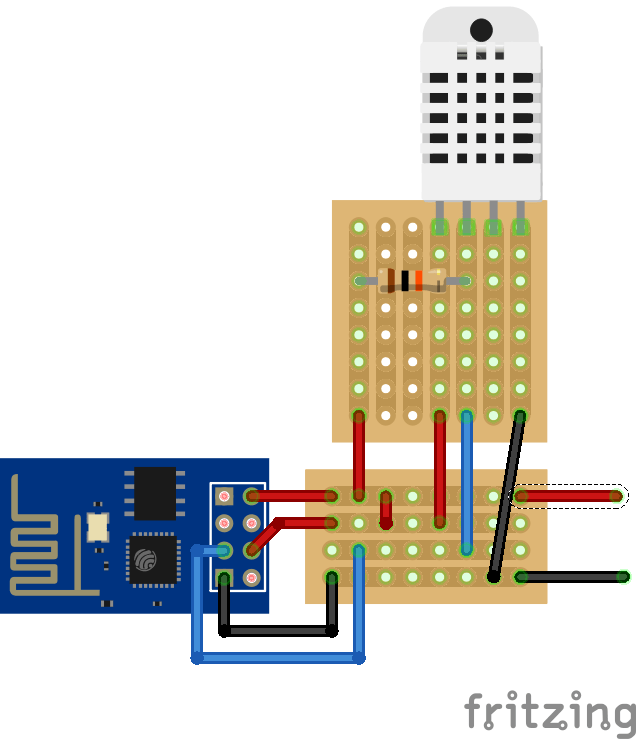 Begin by downloading the DHT library from the Adafruit github repository ( https://github.com/adafruit/DHT-sensor-library). To download, click the DOWNLOADS button in the top right corner. Rename the uncompressed folder DHT and make sure that it contains the dht.cpp file and others. Then drag the DHT folder into the arduinosketchfolder/libraries/ folder. You may have to create that libraries sub-folder if it doesnt exist. You must restart the Arduino IDE programming program for the library to be available. Hi, I’m getting an error when compiling the code. I’m trying to modify your code to work with a DHT11 is this the problem? I’m a novice so any help appreciated. my fault, sorry! While doing some code-update on the blog software, the parser for the source-code has been changed. So what reads “>” should actually be “>”. He changed some of the special charcters to their HTML notation. I updated the code ( hopefully on all places ) and it should work now.